How do judges reach conclusions in complex cases where the law is often open to interpretation, or where the laws are still changing in response to the times? Are judges influenced by cultural currents? Do politics sway their decisions? What role does their material interest play in shaping their rulings and legal reasoning? 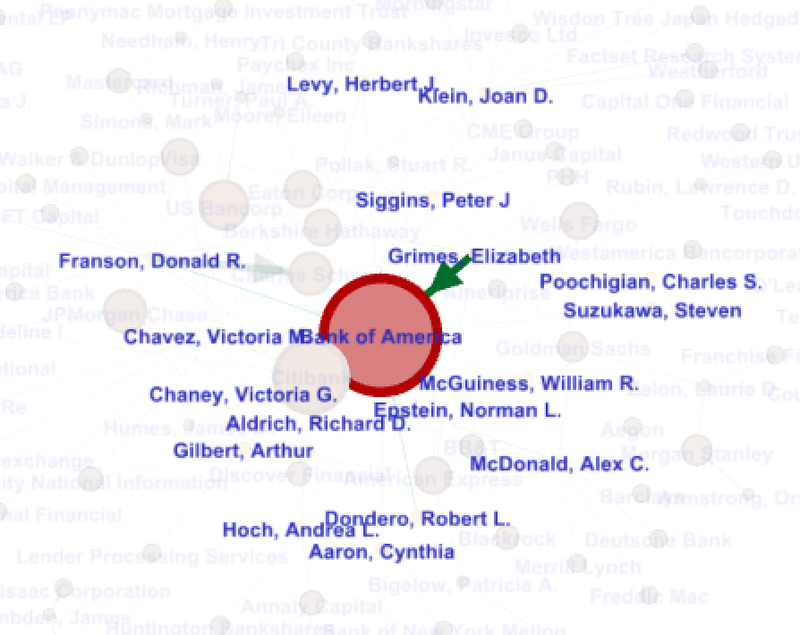 A network diagram of the 42 of California’s 105 Appellate Court judges who own at least $2,000 of stock or bonds in a financial company. 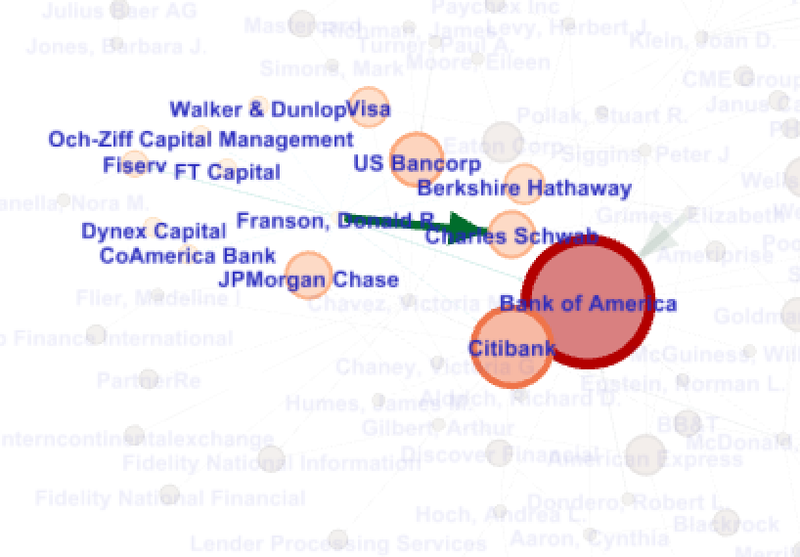 The larger and darker colored nodes are financial companies. 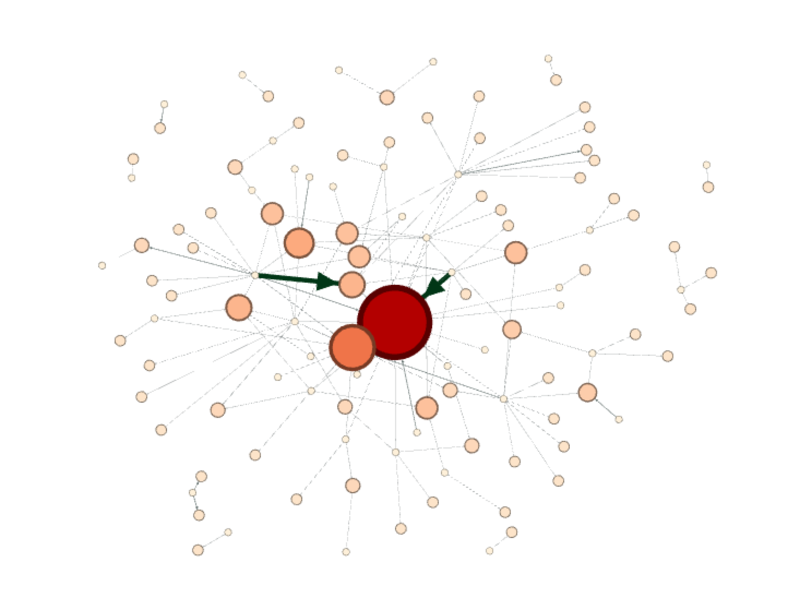 The node size is based on the number of judges who reported an ownership stake in the company. The larger the line connection two node (judges to their investments), the larger the investment in dollar terms. I don’t claim to have answers to any of these questions. But in searching for some possible reasons for the outcomes of homeowner lawsuits against banks, mortgage lenders, and mortgage servicing companies in California, I thought it might be useful to compile information on the economic interests of the judges themselves. The advantage of focusing on the economic interest of judges, as opposed to other factors that shape their interpretations of law, like political ideology or culture, is that material economic interests are literally material, and therefore easily identified and measured. 17 California Appeals Court judges reported owning at least $2,000 of stock or bonds in Bank of America, the most of any financial company. Bank of America is one of the largest mortgage lenders and servicers in the U.S., and has been frequently sued by California homeowners over alleged fraudulent and deceptive business practices, and wrongful foreclosure. Justice Elizabeth Grimes reported owning between $100,000 and $1 million of stock in Bank of America in 2012, the most of any judge. Altogether these 17 judges reported owning as much as $2.3 million of Bank of America securities. 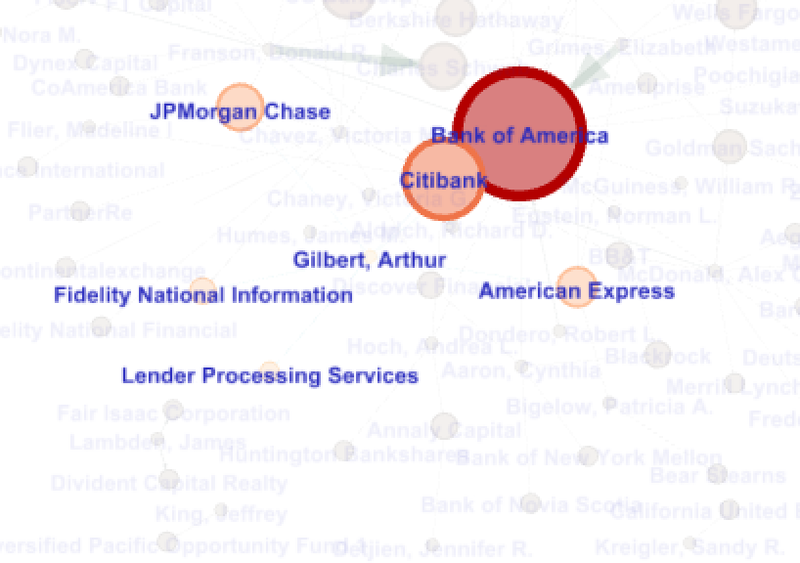 Citibank was the second most commonly held financial company investment by California’s Appeals Court judges. 10 justices reporting owning at least $2,000 in stock or bonds. From 2008 to the present California’s courts have been swamped with lawsuits, many more than in prior years, contesting foreclosures. Most often the plaintiffs have been homeowners suing banks and mortgage servicers over the foreclosure process. The banks have also initiated lawsuits against each other, against businesses, and against homeowners. I haven’t done the research that would allow me to discern whether or not the banks are winning more than borrowers, but what I’ve heard from plaintiffs’ lawyers is that they feel the justice system has been biased in the favor of large financial companies. Lawyers and homeowners say that the courts favor the interests of creditors over consumers. Has anyone compiled comprehensive statistics on the outcomes of lawsuits between banks and borrowers through the financial crisis? I’d love to see that data set. Judge Donald Franson of the 5th District Appellate Court reported owning stocks or bonds worth significant amounts in multiple banks as well as in the Och-Ziff hedge fund (which was briefly financing a foreclosure to rental business), the credit card powerhouse VISA, and Warren Buffet’s conglomerate Berkshire Hathaway (which owns a bank, a real estate firm, and other real estate and financial sector companies). One theory to explain what homeowners and their lawyers perceive as judgements biased in favor of financial companies involves the material interests of the judges. In the most direct sense, many judges own stocks and bonds in mortgage lending and servicing companies, and so these judges might be biased in favor these same companies when they are sued by borrowers. Judges should recuse themselves from cases in which they have a financial interests in the profitability of one of the parties before them, but they sometimes don’t. Recusal is meant to avoid any actual biased options stemming from conflicted interests on the part of the justices, but it’s also supposed to prevent even the perception of a conflict of interest. Perception that justice system is fair is as big a deal it seems as the actual fairness of outcomes, however you might measure the latter. Justice Arthur Gilbert of the 2nd Appellate District Court disclosed owning stock in three of the largest national banks that dominate the mortgage lending market, as well as having owned a financial stake in Lender Processing Services, a small specialized financial company that describes itself as “a leading provider of mortgage and consumer loan processing services, mortgage settlement services, default solutions and loan performance analytics.” Gilbert has sat on appellate panels hearing foreclosure lawsuits pitting banks and mortgage servicers against homeowners. A more nuanced version of this conflict of interest theory has it that judges are ideologically influenced by their class position as high income earners, and holders of considerable wealth, a lot of which is invested in the securities of the major banks, and the mortgage lending and servicing companies. Quite a few of California’s Appeals Court judges are millionaires and they vest their wealth in stocks and bonds of large blue chip companies, often ones that pay hefty dividends. The financial sector is a major investment target for judges, and its biggest banking and mortgage lending companies pay them hefty dividends. Under this theory, even if a judge doesn’t hold stock directly in a financial corporation that argues a case in their court, judges are believed to be influenced by their general interest in the banking and mortgage lending sectors of the economy. Judges are said to exhibit bias in favor of the banks, and to respond to borrowers’ legal arguments with a weary skepticism as rulings in favor of borrowers could upset the appreciation of stocks and the yields on bonds of the entire financial sector. Lastly it should be noted that financial companies are probably not the largest targets of investment by California’s Appeals Court judges. If ranked by the upper end of the disclosed range of investment, finance and banking falls after tech, energy (mostly oil and gas), consumer products, industrial manufacturing, and diversified funds (including private equity, mutual funds, bond funds, etc.) as a sector of the economy where judges like to seed their wealth. California Appellate Court Judges Ownership of Securities, by Sector of the Economy, Reported as of 2012. Sector Low Est. High Est. 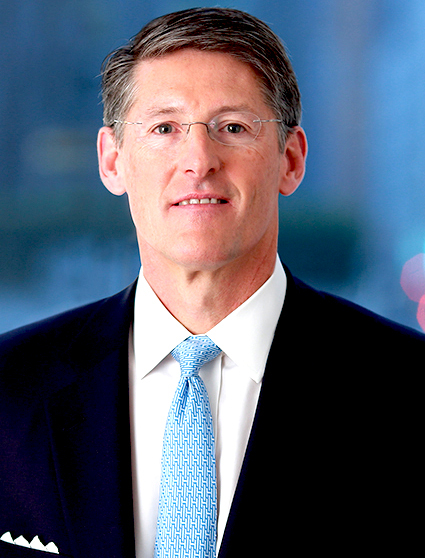 Citibank’s Michael Corbat, 2nd highest paid banker on the list. In 2013 the top 27 executives at Bank of America, Wells Fargo, JPMorgan Chase, Citibank, and Ally —the five big financial institutions most responsible for the foreclosure crisis, and subject to the National Mortgage Settlement— paid themselves $296 million in cash and stock. Under the National Mortgage Settlement these banks were forced to write down principal debt on home loans in California. The average principal reduction they granted on 1st lien loans was about $137,000. 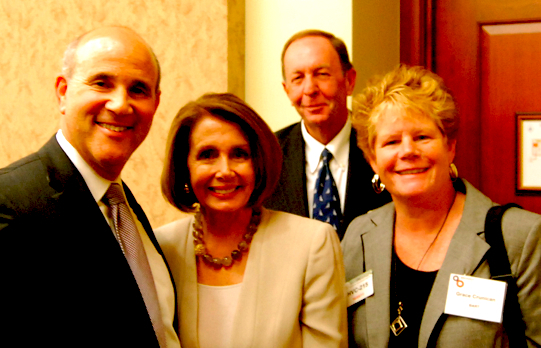 33,000 California borrowers benefited from this. Had the banks applied the $296 million to further principal reduction, instead of using it to pay their top 27 executives, they could have wiped out debt on another 2,164 home loans, effectively saving about that many homes from foreclosure. And if the banks applied the same sum they paid to their top 27 executives over the past 3 years (2011-2013), a total of $735 million, the could have reduced the 1st lien principal debt on 5,367 homes in California. To put that in perspective, there were about 31,400 foreclosures in California in 2013, and 283,000 foreclosures between 2011 and 2013. It would have made a small, but significant, contribution to reducing the number of foreclosures and freeing up the finances of thousands of struggling households. 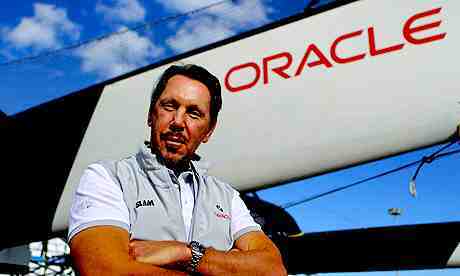 But instead the banks paid their CEOs, CFOs, COOs, VPs and Presidents millions. 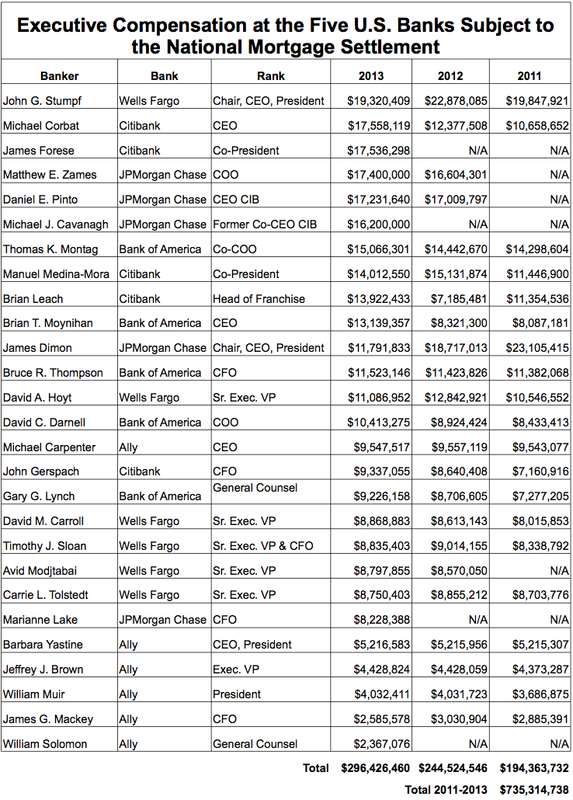 Average pay in 2011 for these bankers was $11 million each. Wells Fargo’s CEO John Stumpf led the list with over $19 million in compensation in 2013, followed Citibank executives Michael Corbat and James Forese. Three of JPMorgan Chase’s bankers (none of them the infamous Jamie Dimon) followed in the 4th, 5th, and 6th position pulling $16 and $17 million salaries and stock grants. In 2014 the pay for these 27 executives, whose compensation is public record, will most likely be up yet again, easily topping $300,000,000. 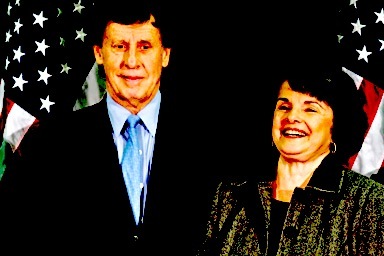 Richard C. Blum and Dianne Feinstein enjoying a chuckle. Last month I published an investigation examining the big corporate investors that have bought up the East Bay’s foreclosed homes, turning thousands of them into rental properties. Featured in the story was Cheri King, an Oakland resident who lost her house due to predatory bank lending and the foreclosure crisis. Now her home in East Oakland is owned by Colony Capital, a private equity firm from Santa Monica run by billionaire Thomas Barrack, Jr.
Last Friday it was announced that a hotel chain owned by Barrack, FRHI Hotels & Resorts, purchased Oakland’s Claremont Hotel. Joining Barrack in buying the Claremont is Richard Blum, husband of U.S. Senator Dianne Feinstein. Whatever the specific terms were, the general gist is that Blum and Feinstein are now business partners with Barrack. What does this mean for victims of the foreclosure crisis like Cheri King, and homeowners currently fighting to stop foreclosure? In her effort to stave off foreclosure by Wells Fargo, and win back her home from Colony Capital, King wrote to Senator Feinstein’s office last year. According to King, Feinstein’s staff were responsive and helpful, but ultimately nothing has come of her attempt to bring the California Senator’s attention to the problem of continuing bank foreclosures, dual tracking, and the investors like Colony Capital taking advantage of this situation. Now that Feinstein is a business partner with one of the largest foreclosure investors in the nation, Colony Capital, will there be a push for more meaningful oversight of the banks that are creating the inventory of empty homes for buyers like Barrack to buy up?